Honey Seared Sesame Chicken And Jasmine Rice! 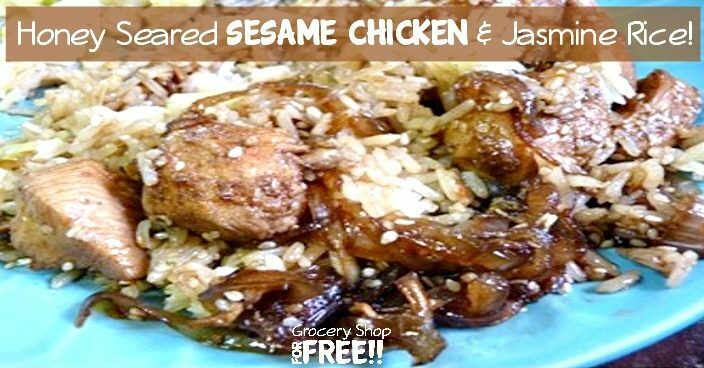 You are here: Home / Recipes / Dinner / Honey Seared Sesame Chicken And Jasmine Rice! Honey Seared Sesame Chicken is one of my daughter’s favorite recipes. It is so easy and can be made so quickly that I can’t believe I haven’t tried it before tonight. Sauté the onion in the oil for about 10 minutes. Cut the chicken into bite sized pieces. Add the chicken to the onions and brown it. In another dry skillet, slightly brown the sesame seeds. Make sure you don’t burn them. I only cooked these for a couple of minutes and stirred them while I was doing it. Set these aside. Mix the honey, ginger, vinegar, and soy sauce in a bowl. Add the sesame seeds to the chicken and stir. Add the sauce and cook it all together for a few minutes to combine the flavors. Serve the chicken over the rice. It should be kind of runny so that the rice has plenty of sauce. I cooked the Jasmine rice in a Pampered Chef Microwave Rice Cooker. To do that, you cook it on high for 5 minutes and then 10 minutes on half power. Then I let it sit for about 10 minutes, still in the cooker. If you don’t have one of these, follow the directions on the package but add the bouillon and seasoning to it when you begin.